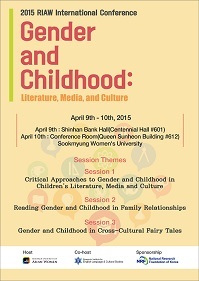 At the forthcoming CIRCL conference in Seoul, Korea, on ‘Childhood and Gender’ Professor Karin Lesnik-Oberstein will give the keynote lecture and other CIRCL members, including Dr Sue Walsh, will be giving lectures. Past PhD students of CIRCL will be coming from Taiwan, Japan, and Greece to speak at the conference, as well as a close colleague from China. The whole conference was organised by our past MA alumna, Professor So Jin Park, who was appointed several years ago as the first specialist Professor of Children’s Literature in Korea at Sookmyung University in Seoul. The conference is being funded by the Asian Association of Women’s Studies (RIAW). This entry was posted in Department of English Literature news and events and tagged Centre for International Research in Childhood, CIRCL, Department of English, Department of English Literature, Dr Sue Walsh, English Department, English Literature, Professor Karin Lesnik-Oberstein, Reading, University of Reading. Bookmark the permalink.